So far we’ve been looking at the economic statistics of the book publishing business over time in an attempt to understand the grim mood in the industry these days. We started by looking at the industry receipts from the early 1990s to the late 2000s and saw a generally positive growth pattern. However, in looking at the period 2002 to 2007, two years for which there are detailed statistics from the Census Bureau, the picture of decline emerges. This is particularly true when we break out the industry receipts by category. Basically, what we’re seeing is an industry in a state of great flux. The number of new titles published annually is on the rise yet the income from those titles is falling. This is particularly true for novels. 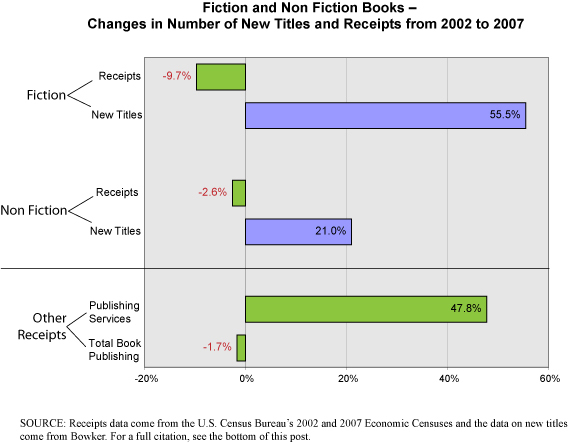 Fiction leads the way in terms of rising number of titles and declining revenues. This translates to more work for publishers for less revenue, at least at the industry level. Within any particular company, this may not be the case. The only subdivision within the industry that is seeing growth is publishing services; its revenues appears to be growing, which may explain the increasing numbers of publishers offering services to the self-publishing crowd. Publishing services, as defined by the Census Bureau, includes such things as the sale or licensing of rights to content, printing services for others, fulfillment services, and sales of ad space. As for books as such–they aren’t really bringing in as much money as they once did, particularly on a per-title basis. This, of course, is a trend that is understandably worrisome for publishers. While dealing with new formats and a need to build new distribution networks, they are faced with downward pressure on prices. Reasons for the gloomy atmosphere in the industry are thus becoming clearer. Worth noting is the fact that we did not, in the calculation presented here, include a category of new titles offered by Bowker which that gatekeeping organization refers to as Non-traditional and defines as consisting “largely of reprints, often public domain, and other titles printed on-demand. The number also includes records received too late to receive subject classifications.” If we had used those data, the growth rate in new fiction titles between 2002 and 2007 would have been 278% instead of 55.5%. This non-traditional segment needs more study. The percentages presented here were based on receipts data from the U.S. Census Bureau’s 2002 and 2007 Economic Censuses, Product Lines by Kind of Business for the United States: 2002 and 2007, available here for 2002 and here for 2007. 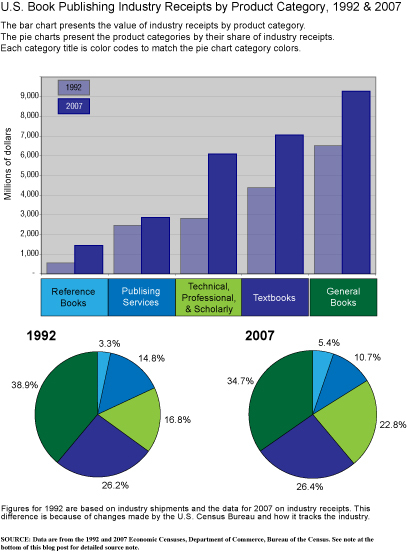 The percentages showing change in number of new titles annually came from calculations of data collected and published by R.R. Bowker LLC and available here. It is worth noting that we had to make some calculated guesses when matching categories between the two sources since they do not use the same classification systems. For example, we combined the following Bowker categories to get a total for all fiction even though it is very possible that some books they categorize as Religion may be fiction as well—Fiction, General Works, Juveniles, Literature, Poetry and Drama. Nonetheless, in the aggregate, we believe that the decisions made in matching categories are useful in getting a broad look at the industry’s trajectory by business category. Feel free to send us inquiries if you’re interested in our more detailed spreadsheets. Book Publishing Industry Statistics – Part 4 will appear once we’re sure we have the numbers straight. In the meantime, a quick note about Barnes & Noble’s newly announced service to help authors self publish their works in eBook format. Here is a link to their announcement of the service which is scheduled to be launched this summer. In essence, B&N is planning to offer authors a web site through which they can (1) submit manuscripts for conversion to an eBook format, (2) offer the resulting eBooks for sale, and (3) help in selling those offerings. We give a nod to The Writer’s Spot blog which is where we first heard about the new B&N endeavor. This move into vanity publishing by Barnes & Noble appears to be another step in the blurring of the lines between booksellers and book publishers. B&N has been publishing its own line of books for some time now so this expansion into vanity publishing is not an entirely new move for them. It is, we think, simply their way of trying to adapt to a world in flux. Plus, with an eReader of their own to promote, the Nook, helping to get more “content” onto the device is logical. What we found interesting in reading this news from B&N is the fact that it is part of a larger restructuring in the wholesale and retail sectors generally. Those in the publishing sector are very focused on their own industry and may not be aware of just how pervasive the restructuring of all distribution networks has been since we entered the twenty-first century. Most supply chains and distribution networks have been greatly impacted over the last decade by advances in communications. The Internet and low cost computing power have totally altered how we buy and sell thing, how we get them to market. Old divisions between manufacturers, wholesalers, and retailers are blurring and not just in the publishing sector. In some networks—think of Wal-Mart—wholesalers are being squeezed out as large retailers are going directly to the manufacturer. In others, the retail landscape is changing dramatically as incomes drop for many on the lower rungs of society, and such people—joined by a financially-squeezed middle class—turn more and more often to big box stores and large discount retailers. Trying to survive as a small, independent retailer in the shadow of these giants is getting harder. Back to books. According to the American Booksellers Association there were 3,250 independent booksellers in the United States in 1999. By 2010 that number had fallen to less than half (1,400). In the first two parts of this look at the book publishing industry—through the lens of economic stats—we saw that over the past three decades overall industry receipts have had a pretty nice and steady growth pattern. Today we’ll try and see if we can detect any interesting pattern in terms of industry receipts that are broken out by product categories–types of books. The categories we’ll use are those used by the U.S. Census Bureau. It’s their data that provides us with the most comprehensive look at the U.S. book publishing industry over time. All five product categories saw growth over the period 1992 to 2007. The categories that saw the most robust growth were Reference Books (10.64% annually) and Technical, Professional and Scholarly Books (7.75% annually). Now we may just be getting somewhere. 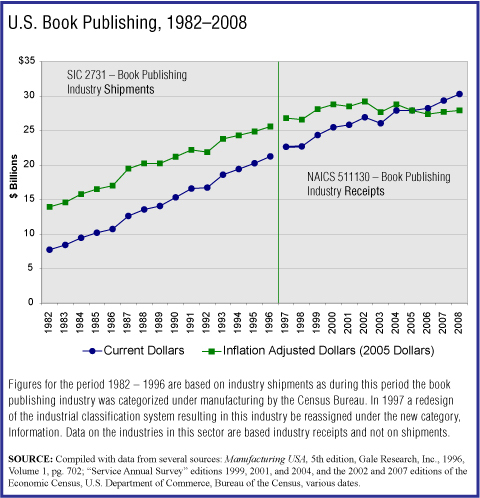 Book publishers involved in the production of textbooks, reference books, and other nonfiction works appear to have done much better over the last fifteen years than did publishers of fiction. (All fiction is lumped together in a single category here–General Books–sadly). Book publishers focused on fiction, or at least the fiction divisions of publishing houses, saw receipts grow by 42.4% between 1992 and 2007, which translates to 2.83% per year. That is not a particularly impressive result, especially considering that the inflation rate during this period ran at 2.57% per year. Book publishing as a whole has been doing pretty well, but the fiction publishing segment is loosing ground. In 1992 it represented 38.9% of the industry. By 2007 its share had dropped to 34.7%. While this is hardly an enormous drop, it is a downward trend. What we’d really like to do next is match up the industry receipts figures we have with some actual unit figures, although we’re not sure we will be able to track those down. But, we’ll try. What is starting to be clearer to us as we study these statistics is just what is causing the sense of doom in the book publishing industry. Trying to sum it up, we could say that the relative decline of the fiction segment, coupled with important changes in the retailing of books and the uncertainty surrounding these shifts, is cause for worry. Cause for further study as well. We’ll be back with more soon. Data for 1992 come from Manufacturing USA, 5 edition, Gale Research, page 704, and are based on the 1992 Economic Census, Product Share Details. Data for 2007 come from the 2007 Economic Census, available online here. The Economic Census is produced every five years by the U.S. Department of Commerce, Bureau of the Census. In Part 1 of this review of the book publishing industry–through the lens of economic statistics–showed that despite the sense of doom that permeates most discussions of the topic these days the industry appears to be doing well, on the whole. Its receipts have been rising at a healthy clip for almost three decades. Between 1982 and 2008 the industry saw annual growth in receipts of 10.8% (3.7% after adjusting for inflation). So, how does this growth rate compare with other industries? Quite well, as it turns out. 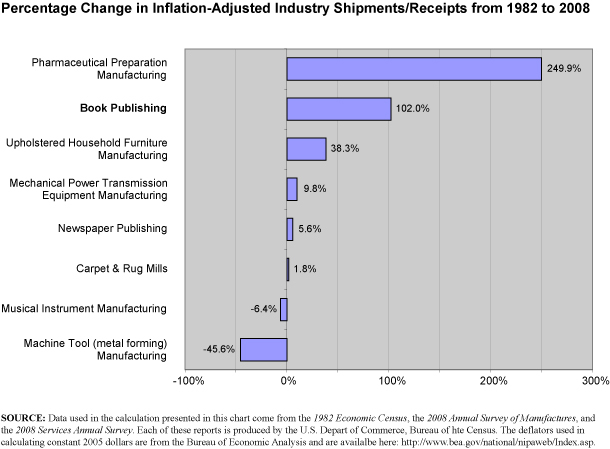 Below is a graph showing the percentage change in industry shipments or receipts for eight different industries, among them, book publishing. As it turns out, among mature industries, book publishing is doing well based on industry-wide revenues. Most other industries we looked at had annual growth rates well under that of book publishing during this period. And we had to include the measure of the pharmaceutical preparation manufacturing industry because its stunning growth over this period is so high and totally outpaces other production industries. One industry we don’t include in the graph but wanted to is the book retailing industry. Definitions of that industry, unfortunately, have changed so much since the early 1980s that we can’t assume they’re comparable at all. Suffice it to say that the book retailing industry (not include Amazon.com, part of the whole definitional problem…) saw its revenues declined by more than 50%–in inflation-adjusted dollars, no less!—between 1992 and 2007. How books are sold, now there’s an aspect of the industry that is in great flux. And perhaps that is what causes such anxiety in the book publishing industry. The industry’s revenues are neither stagnant nor declining–as they are for many industries–so the anxiety must be coming from some other aspect of the business. Before we look more closely at the the book-selling retailers, we’ll take a look at a breakdown of revenues by product category. Maybe that will help us make sense of things. We’ll do that next. Stay tuned. The industries selected here are all mature; thus, we avoided software publishing and cell phone makers. We also avoided industries vulnerable to great volatility because of their dependence on commodities whose prices tend to rise and fall sharply–oil refining, for example. Finally, we selected industries for which comparable data—at the national level and from the U.S. Census Bureau–were available for both 1982 and 2008. Because of the change from the SIC (Standard Industrial Classification) system to the NAICS classification system in 1997, there are many industries for which historically comparable data are not available. The dismal state of publishing is often enough in the air these days so that we can’t avoid watching people wring their hands about the changes, real or imagined, that plague this sector. The subject therefore gets a lot of coverage in print–the print media being part of publishing too. With this as background, we thought we’d take a look at the statistics available on publishing, specifically book publishing. To get an overall view of trends, we graph, below, industry shipments for the 1982-1996 period and, thereafter, through 2008, industry receipts. What is reported by the Census Bureau changed between these periods, but the definitions (shipments/receipts) are close enough for trend analysis. We show these data in current (actual) as well as in inflation-adjusted dollars. The picture suggests an industry that’s doing reasonably well. While this is a very broad overview of the subject, and there is a flattening out in recent years of what had been a most robust growth trend, the picture is positive. And this makes us ask: what is all the fuss about? Are other industries doing substantially better than book publishing? If industry shipments and receipts are not showing signs of decline, what factors are causing the sense of doom of which we hear so much these days? Clearly, we will have to dig much deeper to answer those questions. The U.S. Census Bureau tracks economic activity with a number of important surveys that it carries out at regular intervals. The most comprehensive of these is the Economic Census carried out in all years ending in 2 and 7, so, most recently, in 2007 and before that in 2002. In between the full Economic Census years the Bureau undertakes a different series of surveys to track sectors, if not at the same level of detail. The two series we used were the Annual Survey of Manufactures and the Services Annual Survey. Book publishing used to be classified as part of Manufacturing until 1997; in that year it was reclassified and is now part of the newly created Information sector. In looking things up for yesterday’s post, we came across some interesting quotes from Alfred A. Knopf, Sr., the founder of Alfred A. Knopf, Inc., on the Wikipedia page devoted to him here. The presentation here will consist of the quote—and a comment that ties the quote to yesterday’s riff on commercialization. Too many books are published, and they are overpriced. The statement implies that books not worthy of wide circulation are glutting the market; and the fact that they are overpriced indicates, indirectly, why it is that they are published. This reminds us of the perennial problem of newspapers, particularly dailies. In his book The Image (1961), Daniel J. Boorstin pointed out that publishers discovered that not enough happens, in the way of genuine news, to fill the “news hole.” Therefore pseudo news had be recruited to fill the void. And pseudo books to keep up annual sales, especially growing sales? In the early days, things were quite simple. The books came in; we published them as written. . . . A publisher was regarded—and so, in turn, was the writer—as a pro. A writer’s job was to write a book and give it to you. Here we’d emphasize the phrase “in the early days”—thus in the days before publishing became a kind of manufacturing industry. Implicit in the last quote and in this one is the suggestion that real talent is rare. Comments Knopf made elsewhere indicate what happened as publishing became a production system rather than, as earlier, a service by which humanity’s limited creative insights were given visibility. I guess business became more complicated and publishers less literate. It ceased to be the fact that publishers publish and authors write. Today authors submit manuscripts and editors write books. … and if he can’t get good books, he usually takes what he can get—books that are not so good. And then he sometimes wrecks himself trying to make a silk purse out of what can never become anything but a sow’s ear. Here we see the interplay between limited talent and a great demand to publish or economically to perish. The presumption is that talent is limitless—but it isn’t. And therefore the “shaping of the product” emerges and eventually develops into a kind of production system in which the creative artist is shouldered aside and replaced by craftsmen guided by editorial supervisors. Frequently . . . our American author, whatever his age, experience in life, and technical knowledge, simply can’t write. I don’t mean that he is not the master of a prose style of elegance and distinction; I mean that he can’t write simple straightforward and correct English. And here, only an exceptional editor will really help him. Knopf is equally sour about the new European author. — Now we permit ourselves to suggest that such factors not only play a role in the development of publishing but that they entirely define it. Hidden beneath this is a perhaps unwelcome truth. Not only are talented writers few in number—so are genuine readers. And much of the brouhaha about publishing isn’t really about writers and readers but about producers and sellers of commodities the purpose of which is either to transmit information or to sell conventional emotions. …occasioned by an article in The New Yorker titled “Publish or Perish” by Ken Auletta (April 26, 2010). The article’s subtitle is: Can the iPad topple the Kindle, and save the book business? Our subject is the perceived decline of publishing—and that “random” in our title, we hasten to add, does not wish to single out Random House. Herewith some observation with no reference, we promise, to any electronic devices. Publishing has gradually evolved from an activity centered on substance (the books or the subjects they covered) into a business focused on profits and growth. McGraw-Hill, for example, began when two individuals (James H. McGraw and John A. Hill) became interested in the railroad industry—each in his own way—both concentrating on technical and trade subject. Each formed a company; these companies were later merged. Alfred A. Knopf entered publishing after getting to know John Galsworthy (of The Forsyth Saga fame). He began at Doubleday and then formed his own company—intending to publish European authors who were then neglected in the United States. He was a hands-on publisher who knew his authors. Making a profit was no doubt an element in all this—but his interest was books and authors. MacMillan began as a book store in Scotland. Two brothers ran it. One, Daniel, had a gift for business; Alexander was the literary inspiration behind the venture. The personal touch disappeared as such companies grew large, successful, and then huge. If we look at MacMillan today, one of the tabs on the company’s U.S. webpage is labeled “Publishers,” and under it are names such as the following, each once an independent publisher: Farrar, Strauss and Giroux, Henry Holt & Company, Picador, St. Martin’s Press, Tor/Forge, and others. McGraw-Hill now calls itself McGraw-Hill Companies and includes as its holdings Standard & Poors, Platts (energy information), McGraw-Hill Construction (ditto on construction), Aviation Week, McGraw-Hill Broadcasting, and JD Power & Associates. Knopf has now been absorbed into Doubleday, Doubleday into Random House, and Random House into Bertelsmann AG. That last corporate giant was once, and remains, a major German publisher—but like so many others it has morphed into a multi-tentacled media giant. It also goes the other way around. Simon & Schuster, for example, which lists among its properties…Pocket Books, Scribner, Free Press, Atria, Fireside, Touchstone, Gallery Books, Howard Books, Atheneum Books for Young Readers, Little Simon, and Simon Spotlight…is itself the property of CBS. Now we would propose here that the woes of publishing might—just might—have something to do with this massive corporatization of book distribution. It is a process in which the origins of the industry have been submerged way, way below the surface. It would be extremely difficult, we think, to find a publisher who actually reads a book, as Alfred Knopf certainly did—or engage with authors in extensive correspondence. Now if we couple this evolution with a very parallel transformation of book retailing, we manage at least to paint a tiny little target at which we might aim our rubber-tipped arrows in trying to hit the subject. What publishing, you might ask? Is anything actually left of it? Or is the sound and fury that of something else—some rough colossus slouching around the globe to find the customers it can no longer even see?